Nuummite is an extremely rare mineral that was found 1982. Its occurrence is limited almost exclusively to the Nuuk region of southwestern Greenland from where it gets its name, Nuummite means ’derived from Nuuk’. It has since been found in several localities in the outer part of the Godthabsfjord near Nuuk. Other minor occurrences of Nuummit include Spain and southwest of Douglas, Converse County, Wyoming, U.S.A. but it is only in the Greenland type that the coloration is well enough developed to be suitable for gemstones. 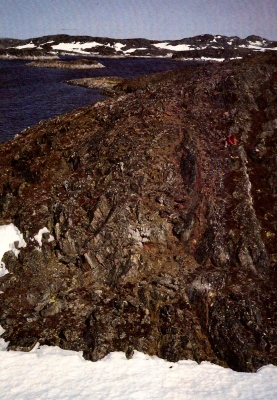 The Picture shows the Malene mountain, the first locality where Nuummite was found. The occurrences form lenses up to one meter wide in the slightly rusty band. By virtue of its age Nuummit is unique - there quite simply is no other comparable material of the same age anywhere on earth. The area of Nuuk where Nuummit occurs is the “Isuakasia” iron ore, the origin of which dates back almost four billion years! The Isuakasia, where it’s obtained, is situated close to the Inland Ice Cap which is very difficult to access. For this reason combined with their rarity, these minerals will never become available in large quantities. Nuummite is a gemstone formed from a mixture of two minerals from the orthoamphibole group: Anthophyllite and Gedrite and was discovered by GEUS (The Geological Survey of Denmark and Greenland) 1982 but one could say that it was a rediscovery since specimen collected by K.L. 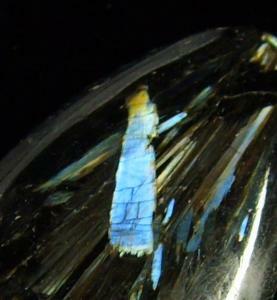 Giesecke in 1810 similar to that of the sample that was described by Bøggild O.B.1953 in ”The Mineralogy of Greenland”. 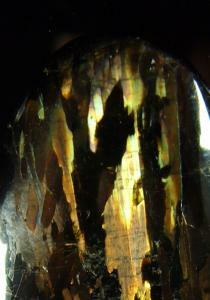 Nuummite has just recently appeared in the gemstone market. It has since been fashioned into extremely attractive cabochons and miscellaneous shaped pieces for Jewelry. In larger pieces it is possible to retain most of the colors of the iridescence (i.e. 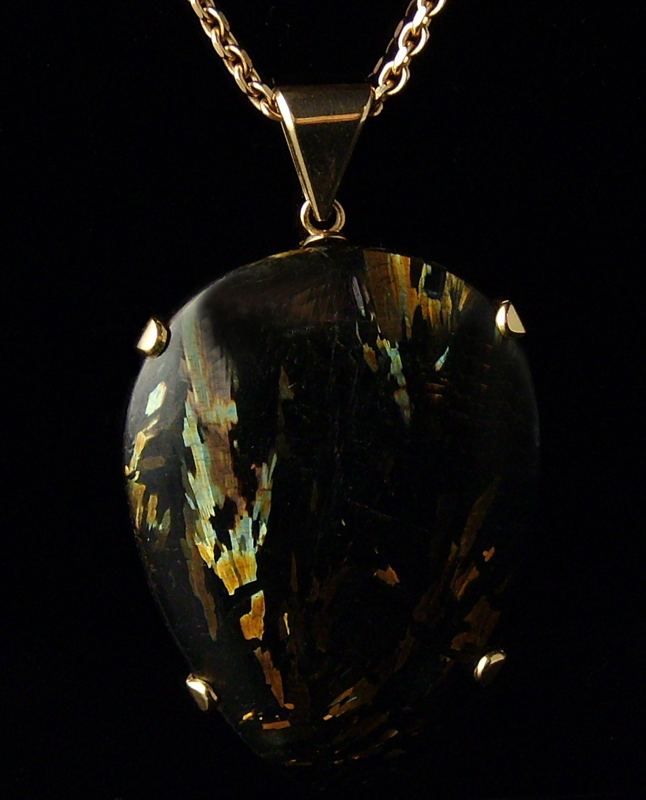 the rainbow like color effects seen in some gems), so that one end of the cabochon has a golden hue while the opposite end has a bluish tone. The Nuummite is said to be very powerful for meditation and is believed to increase clairvoyance and the intuition it also possesses defensive qualities and is excellent in order to shield from many shapes of negative energy.